Following on from our recent news about the launch of photo sharing on plotaroute.com, we are pleased to share with you details of further enhancements linked to this. Firstly, we have now made it possible to link photos you've uploaded with selected route directions, so you could for example upload a photo showing an unclear turn on the route. You can link photos to directions by editing the direction and then selecting the photo. We've also made changes to the way route directions are edited to make editing easier to do. Secondly, we've added an new option to include photos when you print a route. These can be printed inline with directions (where photos have been linked to directions) or printed on a separate page. Thirdly, we've added a new option to print a cover page for your route, showing key information about the route along with any notes that have been added and a close-up map of the start point. And finally we've fixed a few small bugs and made a few tweaks along the way! 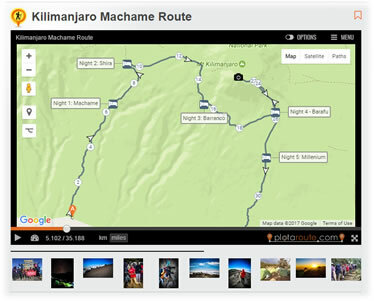 To see an example of a route with photos have a look at the following route: Kilimanjaro Machame Route. Thanks for all the recent changes that address many of the points I raised. I've tried the new printing options and the photos in-line with the directions do exactly what I want. I've noted one small bug. When the directions flow on to a second page, a title appears superimposed over the directions at the top of the second page. It says 'ROUTE PHOTOS' and I'm guessing should really only appear when the photos are requested as a separate sheet. I'd attach the PDF to show you but I can't see a way to do this. Thanks for flagging up the page flow issue Martyn. A fix has just been implemented for thus, so hopefully it should be OK now. I just want to say a huge "Thank you" for making the changes... and so quickly. I've been in touch with the folks at the Camping Barn (to which my route leads) and they are most appreciatlive. I'll be going Ad-free when I get a moment to sign-up and will then add more photos to my route. I've added a full set of photos to my route (365296) and I'm now very pleased with the printed result! The 'Used for' field is missing from the first page of the printout. (It is also missing from the 'View' screen, i.e., the one someone sees if they are sent a link to a route.) This seems to be important information. Without it, someone could well attempt to cycle a route that is really only suitable for walking. Please could it be added in both places, perhaps? Now that the 'Creators Notes' field is well visible in the printed output, I've been adding much more information to it and I've hit the maximum charater limit. Is this limit a fundamental, technical constraint or simply an ad hoc value chosen when the database was first set up? If it could be extended, I think it would enhance its usefulness. I'm also wondering if the editor window for this could be enlarged. It is so small that the chunk of text being worked on scrolls right through the window which is confusing. Could this field even be made HTML with the same editor I'm using here for posting a comment? This would enable proper, clickable links. Glad you're finding the new photos feature useful. On the question about whether a route is used for walking, cycling, etc....when you view a route there is a different icon above the map indicating which option was chosen when saving the route. The same icon appears on the print out. I can see that it would sometimes be useful to be able to add more notes when saving a route. This wouldn't be a simple change though, so we would need to consider it alongside other requests competing for development time. I've added it to our Feature Requests list (number 69). Re walking/cycling marker - OK I see it now... but easily overlooked (neither I nor my contact at the Camping Barn had noticed this.) The icon seems very obvious when used as a route start-marker on the maps but not so obvious in this context. Re a change to the notes area - I can appreciate that this could require quite an overhaul. I'm happy to wait to see if others vote for it too. I have just tried to add some comments to the new feature request that you have created for me (No 69). However, when I clicked on 'Start Discussion' it took me to the screen to create a new forum topic. The result is I've started a new, parallel discussion rather than commenting on the Feature Request. The forum is right place to start a discussion on the feature request - thanks Martyn.